Beholder is rated 3.2 out of 5 by 24. Rated 5 out of 5 by DGA1961 from Best Big Fish Release Ever! I LOVE this game. My only regret is getting on BigFish instead of Steam, because their game manager is better, but,. I started off very frustrated with the game. I assumed my job was to do as I was instructed. That is so far from the truth! Turns out, your goal is to save and rescue as many people as you can! If you talk to everyone, you will find out they have needs, and they have skills. Take what one guy needs and trade it with another guy for what he needs! Get that guy on a train or a ship and get them out of the country! Rated 5 out of 5 by 1game_fan1 from Awesome! So glad to see something other than the million cookie cutter hidden object games that are released every day. The visuals are stunning, the gameplay is easy to pickup, and the story is so unique. BigFish- let's get more games like this one! Rated 5 out of 5 by Bunface82 from great challenging game, definitely not the usual not suitable for gamers who only like fast pace games, who ONLY love colorful/cute/fantasy graphics, not suitable for gamers who prefers a lighter storyline. This game kept me up all night, i am not very good at this game but I still love it. it is challenging and thought provoking. Every thing you do, changes your fate. The graphic is simple, which i believe was the purpose to keep it less cartoonish. Highly recommend it to anyone who love games like Nancy drew or games that are more puzzle based. I tried the demo and bought this game. Gamers should try this game on trial before buying, it is not for everyone. Rated 5 out of 5 by irrce from Very unusual This game is quite unique, and I am very pleased to have found something so different. I like colorful, fun games with cheerful music as well, but it is great that I can play something like this for a change. When you have to make a decision in the game you often can not predict the outcome, which keeps it interesting. This game makes you think. I can recommend it. Rated 5 out of 5 by ArizGamer from Yay! An Awesome Game I've bought over 40 BigFish Games and this is the first time I've ever felt the need to write a review. I loved this game. It took me several tries (deaths) before I got the hang of it and I really enjoyed it. Thank you Big Fish games -- Hopefully you'll see that some of us are getting tired of the same old same old HO games and you can give your loyal customers (like me) more selections to choose from. Thank you, Thank you, Thank you BF Games! Rated 5 out of 5 by LunaNik from Vive la revolution! 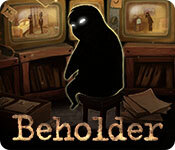 Beholder is one of the most unusual, unique, and original games I’ve ever played. If I had to pigeonhole it into a genre, I’d have to call it a cross between third-person point and click adventure game and a strategic resources management game. The game universe is a dystopian world run by a fascist government that spies on its citizens, rewarding conformist behavior and swiftly punishing rebellious acts. The short film that introduces the game quickly drew me in, since I adore dystopian themes. 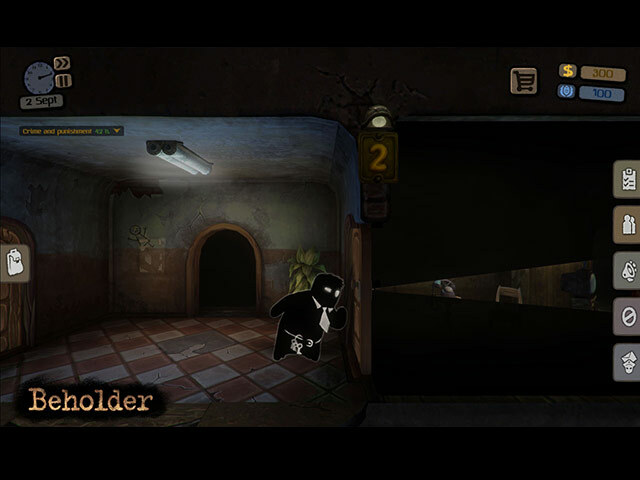 Our protagonist, Carl Stein, has been assigned by the Ministry to watch over the tenants in an apartment building, which brings us to the gameplay. You can customize the controls, but I chose to use the default: mouse for camera movement, and WASD to move Carl. You’ll get assignments from the Ministry, including installing and monitoring surveillance cameras, searching his tenants’ apartments, and so on, then reporting anything suspicious. And the Ministry’s directives change so that things that were one acceptable become illegal. There’s a fairly good tutorial to accustom you to the tools at your disposal, and there are two difficulty levels. The graphics are mostly neutral, as befitting the dystopian theme, and are sort of a cartoon and torn paper collage. To be honest, it’s refreshing to see a game so totally out of the box and so different from the unmemorable fantasy-themed simplistic HOPA clones we’ve been getting of late. Kudos to this dev for innovation! Rated 5 out of 5 by patricia356 from Nice to have something a little different You are living in a repressive dystopian world where you are forced to take a job as caretaker and spy on the tenants of a building. 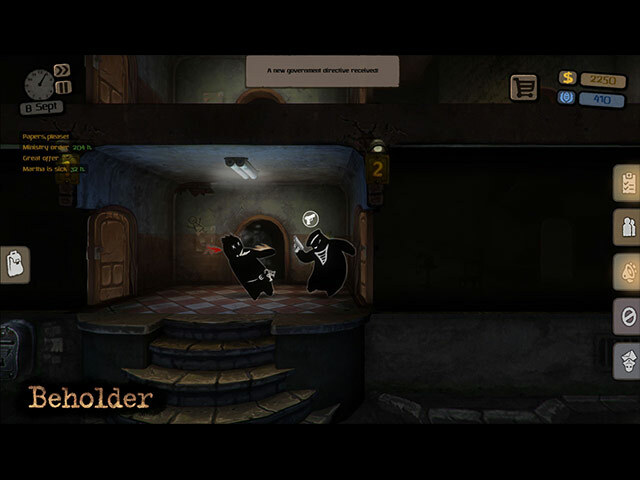 It is a point and click game which makes you move around and interact with different objects and characters. Like some of the older games. You do get a lot of hints so it is not as difficult. You keep getting new govt directives which sometimes are rather close to the truth. Figures are all black with some small detail to give them some humanity. I thought the choice of these figures was in keeping with the theme of the game. The setting is dark and bleak yes, but is part of this world. There is a multilevel building with apartments you must search when they are vacant. 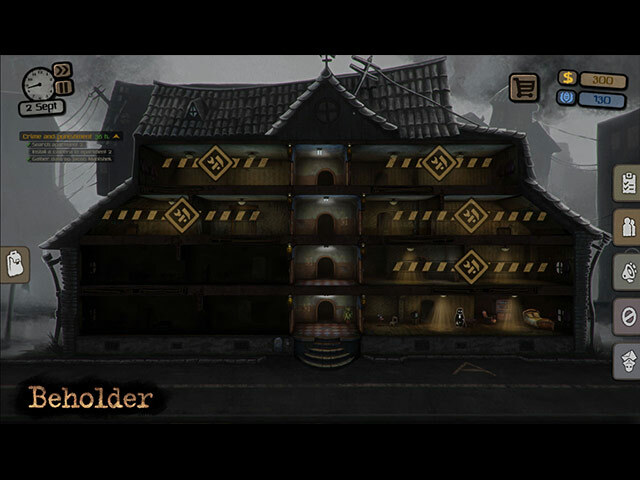 You will have all sorts of bells and whistles to keep you informed, hold items you find and purchase (or steal). I have a touch laptop and moving around was great fun. Just pulled the screen around. You can also use the WASD keys or the mouse. I agree with the previous reviewer that this will not be everyone's cup of tea. If you like a thoughtful decision making game with enough action to keep you going then you will love it. I also suspect that your decisions can make outcomes change. I look forward to playing the scene again to try it. My only criticism is that some of the areas are a little too dark. I would like to see items better even the ones that are not used. Try this out before you purchase to make sure it is for you. Rated 5 out of 5 by Justy1002 from I actually enjoyed this This isn't the first point and click game I've played in my lifetime; however, this one was different from most. I played this in beta, and at first glance I wasn't sure what to make of the scenery, as well as the subject matter; however, as I went along, I found myself wanting to delve further into the game. Be sure to check out the game settings before you play. You have keyboard binds you can use/create for camera options within the game. Also, getting back to the main menu is as easy as hitting the escape key. I strongly urge you to try the demo with an open mind. Not everything is shiny happy. Even dark things can be surprisingly fun. Rated 5 out of 5 by pennmom36 from Dare I Say No? Dear Carl Stein: Your life is about to take a drastic turn. You're the lucky new Landlord of the Class D Apartments on Krushvitze 6. You're mission, should you decide to accept (I wouldn't suggest otherwise) is to spy on your tenants and report any suspicious behavior. You will install cameras in every apartment, and go through all of their personal belongings when they aren't home. You will document their hobbies, interests and even their conversations. We have taken the liberty of moving your entire family, and you have been drugged so that you'll have no need for sleep. Any Questions? Signed: The Ministry of Allocation. This has got to be one of the strangest Click and Point games, I've ever played, and I'm pretty sure it's the first Black and White graphics game. On one hand I feel sorry for poor Carl who has little choices, on the other hand, what a horrible landlord and father! Carl must wait for tenants to leave their apartment, use his key to enter, install surveillance cameras, then snoop, by opening drawers, reading diary's, even checking under their beds for contraband. Anything that seems suspicious is documented and reported, which usually means they are arrested. The Ministry sends out new directives which state what citizens can and cannot do, they can't even buy an apple! If you've never played this type of game (this is not a HOP) basically you control every move Carl makes, by clicking where you want him to go. Areas that can be interacted with, will highlight when you scan your mouse over it, and when you click on it, Carl will interact with whichever icon you choose that pops up, such as a magnifying glass to search for items or use a key to open, answer the phone etc. Objectives are listed on the upper left corner, but it's up to you to figure out what to do to achieve those goals. For instance, Carl's wife needs a large pan, so you must go to the neighbor's and ask to borrow one, they may say they don't have one, but another neighbor might. You will need to have conversations with everyone, because they may have information, they may need your help etc. When you have a conversation, several key conversation questions will appear that can be asked in whichever order you deem necessary. This is the kind of game that makes you think, and it can be quite addicting once you get the hang of it. Because this isn't the kind of game that will knock the socks off of everyone, I strongly suggest trying the demo, you may find that you enjoy the unusual aspects it presents. There is a fairly decent tutorial that explains how to play, this point and click game which can be zoomed in and out to get a different aspect. Enjoy, and aren't you glad we have choices!